I'm someone who gets really excited over new food finds - and that's something Jesse is always teasing me about. I scour the grocery store catalogues each week searching for the big NEW! stickers and always check the aisles for new ingredients and products I haven't tried before. Having so many different allergies my hunt isn't always successful, so when I find something new that I can eat - I get super dooper excited. One of my more recent new food finds was Teff. I'd heard lots about the grain in the past - and even managed to try it whilst we were in the US last year - however, it was impossible to find in Australia. I couldn't buy it here and I couldn't ship it in due to import restrictions. For a while I forgot all about it until it popped up in the Coles catalogue one week and I rushed off to our local store to grab me a packet. Literally... grab. As in, crazy insane girl in the health food aisle jumping up and down about her latest food find only to have her mother say "Teff? Teff..... are you sure you can eat that? It sounds like something you'd find growing in the middle of a wheat field". Ah, ye of little faith! But, since teff isn't exactly a well known ingredient, I thought I'd start off by introducing you to my new teeny tiny little friend! What is Teff? < this pin it button will pin the info for you for future reference! Teff is a teeny tiny ancient grain (even smaller than a poppy seed) that grows predominately in African regions. It comes in a variety of different colours (white, red and brown as shown) and has a mild, nutty flavour. The grain might be small but it packs a nutritional punch as it's high in protein, calcium and iron and has a brilliant balance of amino acids. Is Teff Gluten Free? Yes! 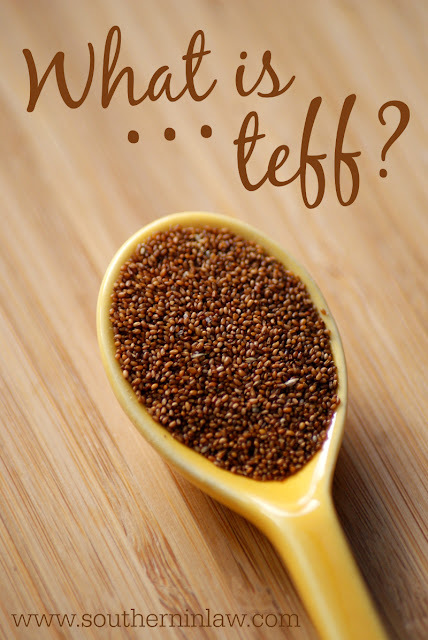 How do you cook Teff? Teff can be ground into flour and used in bread or baked goods (it's traditionally used to make injera; a flat, pancake like fermented bread), made into a porridge or pudding like dish and it can be eaten steamed, boiled or baked as a side dish or main course. Where to buy Teff in Australia: At the moment I've only found teff grains available at Coles (in the health food section), however, I'm guessing that as this tiny grain gains popularity it will start popping up everywhere! But how did I try teff for the first time? The same way I try just about any new grain - for breakfast! I decided to make a teff porridge the first time I tried using teff and it was then that the inspiration struck for this recipe! 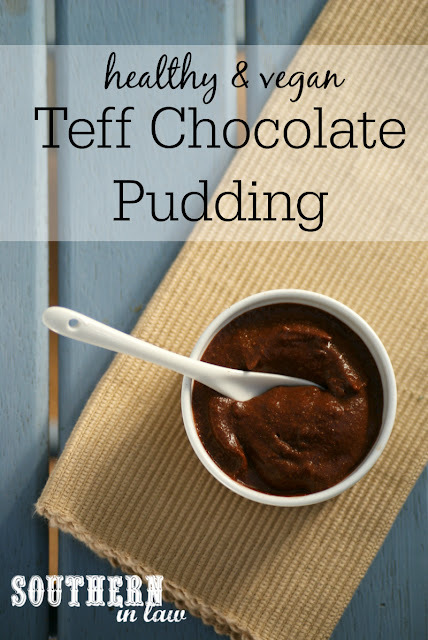 Teff makes a deliciously thick, pudding like treat so naturally I had to make a healthy chocolate pudding recipe! I was hesitant to give this to Jesse to try as he's pretty stuck in his ways with certain foods, however, I was pleasantly surprised when he came back to me, empty bowl in hand and said with a smirk; "That was rubbish.... I think you need to make some more". It got the Jesse seal of approval and it's healthy enough to eat for breakfast. What more could you want?! Place your teff flour and cocoa powder in a medium saucepan and add in around 1/4 cup of your milk, mixing to combine the dry mixture with your milk. Once your teff flour and cocoa have mixed in with the milk, add the remainder of your milk, as well as the maple syrup, vanilla and salt, stirring until the mixture smooth and combined. Place your saucepan over a medium heat, stirring constantly until your pudding mixture begins to thicken. The pudding will thicken as it cools so keep that in mind, however, you can make it as thin or as thick as you like - just be sure to keep stirring so it doesn't go lumpy! It should only take 2-3 minutes in total. Pour your pudding mixture into serving dishes and serve warm or chill in the fridge if you'd prefer a chilled pudding. But tell me, what is your latest food find or what ingredient have you recently tried/bought for the first time? And have you ever tried teff? any substitute for teff flour? would oat flour work? Hi Candace, obviously substituting the teff is going to give you an entirely different taste/texture but we did try a version with oat flour which worked (though the taste/texture is completely different). 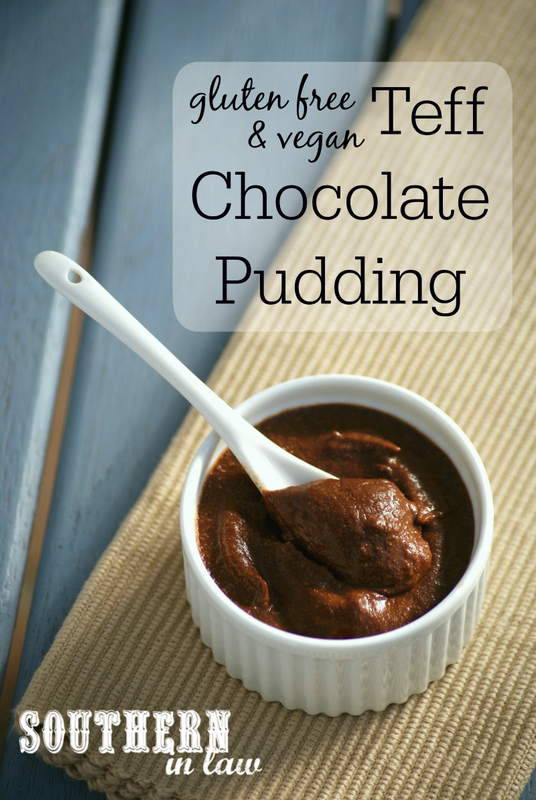 It is totally different and totally delicious - you'll have to let me know what you think! I gave this a shot with oat milk as my wife is allergic to almonds. It didn't set hot or cold. So then I added cornstarch and it got all clumpy. I thought it tasted ok but my wife didn't like it. Was there supposed to be a thickening agent in it? 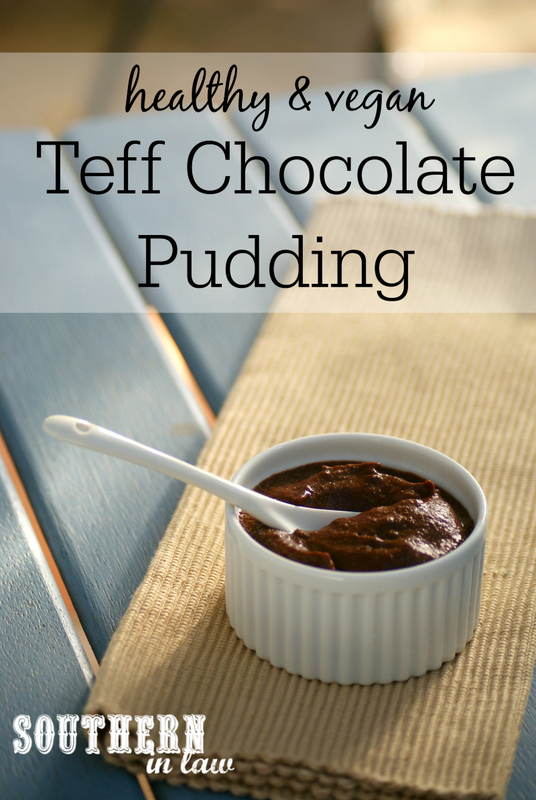 Hi Rachel, the teff flour is what thickens this pudding. It takes a few minutes to thicken but it should definitely come together and thicken up! Did you happen to add anything else or change the original ingredients or method? The only difference was the oat milk, which was Pacific brand. Hmm that's very odd! How long were you cooking it on the stove for? I followed the directions exactly. I heated it for an extra minute or so since it didn't thicken and then put it in the fridge hoping in would thicken in there. I've just tested the recipe with oat milk and it still worked perfectly - and I had some of our recipe testers give the recipe yet another try and I can't seem to work out what the problem is as no one else seems to be having a problem with the recipe. Did you use teff flour or grind teff grains into a flour?